TriMet will be holding a community meeting on Wednesday, May 14 to discuss efforts to create a permanent facility in northeast Portland that will move Line 8 layovers off the street. The meeting will be held at 6:00 p.m. at Classic Foods, 817 NE Madrona. TriMet has narrowed down the search for a site to two possible locations. 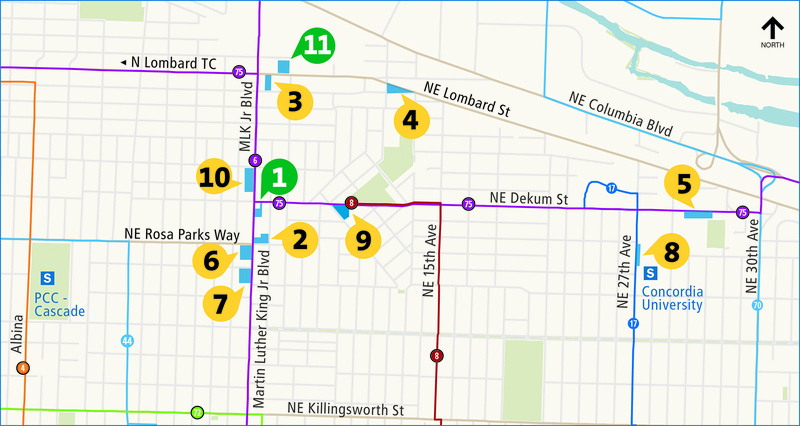 The Line 8-Jackson Park/NE 15th Ave is one of our busiest bus lines, providing about 6,000 trips each weekday. The permanent facility will include off-street parking for buses and a break area and restroom for our operators. Currently buses are laying over on the street at two sites, one in the Woodlawn neighborhood and the other in the Piedmont neighborhood. Creating a permanent location for operator layovers may improve on time performance and service reliability for our riders, and it may also allow for a new TriMet stop to transfer between the Line 8 and the Line 6-ML King Jr. It will also provide a safe, comfortable and convenient place for our operators to take their breaks. Both sites are in primarily business-oriented areas and have the space for buses to park and maneuver. Also size, zoning, proximity to homes, cost and distance from the end of the line at Northeast Dekum and Durham were part of the consideration. The two sites are privately owned and the owners are willing to sell. 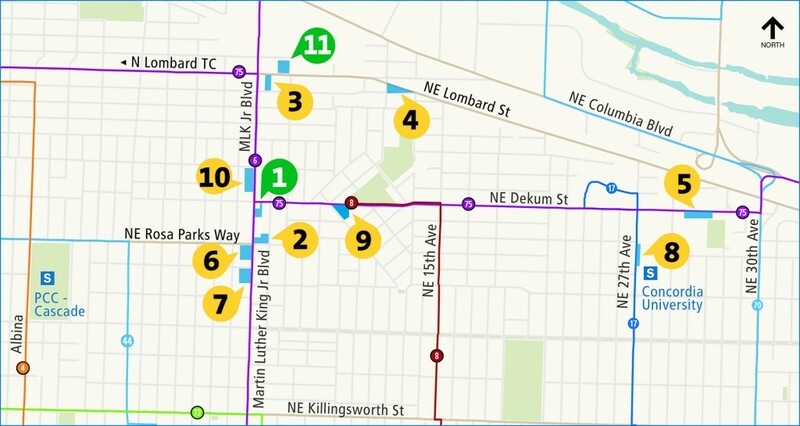 TriMet studied 11 sites for a future permanent layover facility in NE Portland. Only sites 1 and 11 are still under consideration. Once a final location is identified and purchased, TriMet will construct a permanent facility that will include space for our bus operators to take breaks as well as a restroom and other possible amenities. Outside, we’ll add landscaping and lighting, and possibly sound walls and other elements. Line 8 buses would arrive and depart the layover location up to every 15 minutes, approximately 5 a.m. to 2 a.m. Monday through Friday, 5:30 a.m. to 2 a.m. Saturdays, and 6 a.m. to 1 a.m. on Sundays. Other bus lines may use the facility as well. In addition to the community meeting at 6:00 p.m. on Wednesday, May 14, feedback can also be given via email to line8feedback@trimet.org or by mail to TriMet, Public Affairs, 1800 SW 1st Ave, Suite 300 Portland, OR 97201-9904. TriMet staff will also be talking with bus operators to get their thoughts about the different options. The plan is to begin purchase of one of the sites this summer with the permanent facility built and operating sometime in 2016. For more information, visit trimet.org/line8. Deadline for comments is May 30, 2014. Changes to the Line 8 made in September 2012 led to buses laying over at Northeast Dekum and Durham. After concerns were raised by the neighborhood, TriMet moved the layover location, and has continued to work with residents, businesses and the Woodlawn Neighborhood Association to lessen the impact of the changes. In spring and summer of 2013, we were able to move bus layovers to alternate temporary locations, while working on a permanent solution.